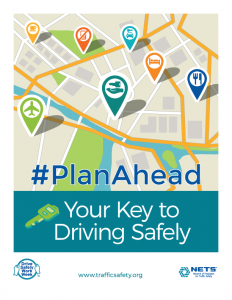 The campaign theme this year is "#PlanAhead-Your Key to Driving Safely." Campaign materials underscore that planning may be the most critical leg of any driving trip, whether the trip takes place on the job or off. Among other topics, materials cover the importance of planning for travel that takes place in unfamiliar territory and remind employers that they carry risks and liabilities similar to company-vehicle drivers for any employee who drives a personal or rental vehicle for business purposes. Get the NETS DSWW toolkit. Browse Vehicle Safety signs and labels.